Respiratory support. 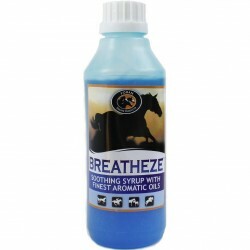 Soothing syrup with finest aromatic oils for horses. Potent soothing syrup with decongestant and expectorant properties. Suitable For: All horses except in-foal or lactating mare. Breatheze is designed specifically to provide soothing relief from coughing, and at the same time reducing mucus build up within the airways. Respiratory soundness is restored by combining potassium iodide, a mucus thinning expectorant, with carefully blended powerful decongestants including eucalyptus oil to soothe airways. Discontinue use 7 days prior to competition. Directions for use: To be mixed daily with feed.